Flow Chemistry Market size was USD 900 million in 2015, and is anticipated to grow at over 10% CAGR. Rising focus towards sustainable manufacturing process in the chemical and pharmaceutical industry will fuel business growth. The process involves minimum heat exchange as compared with conventional batch processes, which ultimately offers effective and precise results and therefore improves the productivity. This makes the process widely accepted across end-user industries including pharmaceutical. furthermore, batch reactors are not suitable for wide variety of chemical reactions owing to massive heat evolved during the process. Flow chemistry offers safer chemical reactions, considering both environmental and human/worker safety concerns. Furthermore, it also offers a harmless method for heating huge volumes of combustible chemicals and materials. This is forecast to positively stimulate the global flow chemistry market size by 2024. The flow chemistry market share offers various competitive advantage over conventional batch processes. However, concerns regarding technology scale up for commercialization is the biggest challenge faced by the industry including pharmaceutical and chemical, as the initial technology was developed precisely for the laboratory purposes. Scaling up for commercialization will extensively require new investments for labs and adaptable equipment. This trend is likely to hamper the global flow chemistry market size by 2024. For instance, microreactor systems are not capable to contend with huge manufacturing units owing to its multipart structure. However, emerging industry applications across bio-diesel manufacturing process owing to its high effectiveness, minimum raw material consumption and low carbon emissions will positively impact the business growth by 2024. Continuous stirred tank reactor (CSTR) dominated the global flow chemistry market size in 2015. These reactors are operated in series to improve the reaction efficiency. It is used in both the petrochemical as well as chemical industries, where low material & energy consumption, results in substantial cost savings along with high production results. In addition, it also offers significant savings in terms of area occupied in comparison with batch reactors. The global flow chemistry market size for pharmaceutical is the fastest growing segment by 2024, as it helps to offers high yield along with low operational cost and will positively impact the industry growth over the estimated period. It also offers high safety measures as compared to batch reactors. In additional pharmaceutical industry share contributors including Chemtrix BV are widely accepting flow chemistry for medicines and drug manufacturing. This trend will boost the overall industry growth by 2024. North America, led by the U.S. flow chemistry market size is forecast to witness gains more than 9% CAGR over the projected timeframe. Robust pharmaceutical industry in the region is the major factor contributing the overall regional industry growth. Furthermore, substantial petrochemical and natural gas feedstock in the U.S. will boost regional growth. 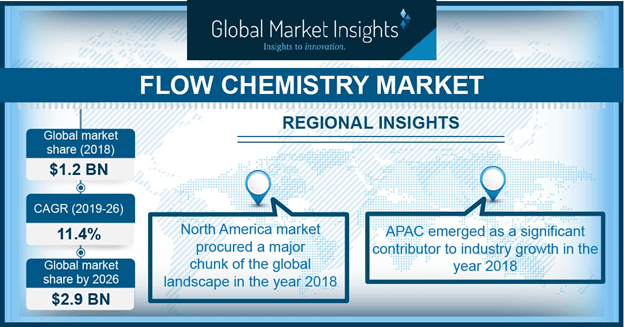 Global flow chemistry market share was considerably consolidated in 2015 with major industry players accounting for more than 40% of the total share in the same year. Key industry players include Vapourtec Ltd., ThalesNano Inc., Uniqsis Ltd., ThalesNano Inc., Milestone Srl, FutureChemistry Holding BV, AM Technology, Chemtrix BV and Koninklijke DSM N.V. Leading manufacturers have entered into strategic partnerships and collaborations with multinational chemical, petrochemical, and pharmaceutical manufacturers in order to retain their global presence and enhance their industry share. The industry is price sensitive, with unceasing technological advancements from major industry players striving to achieve to gain competitive advantage in addition, the industry players have a moderate degree of forward integration in the industry ecosystem, which complements their presence. Global flow chemistry market size is primarily driven by increasing technology applications over conventional semi-batch and batch operating methods. As the technology have competitive advantage to reduced raw material requirement with value added production capability. In addition, it also offers reduced carbon emissions, making the chemical exothermic reaction environment friendly. However, concerns associated with technology scale up for commercialization, for its use across large scale industries such as pharmaceutical and chemical is likely to obstruct the global flow chemistry market size by 2024.